2008 was not a great year for movies–not as good as last year, for instance, when we got three outstanding comedies from Judd Apatow & co. (”Knocked Up,” “Superbad,” and “Walk Hard: The Dewey Cox Story”), one of the best Coen Brothers pictures ever (”No Country for Old Men”)–well, if I don’t stop here, I’ll end up listing my entire Top Ten for 2007. But 2008 wasn’t nearly as much fun as the year before. In 2007, I went to the movies–drive to the theater, buy a ticket, sit in the auditorium, not watch at home on TV–141 times. Tonight, the curtain falls on a year that left the most hardened political observers breathless. I did not get the nominee I wanted. Heaven knows I did not get the president-elect I wanted. But as an American, particularly one blessed with a radio show and a newspaper column, I cannot help but feel grateful for the ride. If Israeli reporters are correct, Olmert will accept Sarkozy’s suggested 48 hour pause as a prelude for a more permanent agreement. Israel claims to have degraded Hamas military capability and Hamas demonstrated it can hit Beer Sheva 40 kilometers away. It can afford to call it quits. But will it? I hope so. The why and the wherefore? Permanent link: The why and the wherefore? A Double Standard in Transcription? Permanent link: A Double Standard in Transcription? How could you be misquoted in your own autobiography? Well, it happened to basketball player-turned-broadcaster Charles Barkley who explained the matter simply, “It was my fault. I should have read it before it came out.” In all likelihood the problem was that Sir Charles employed a ghostwriter, nothing to be ashamed of since it puts him in decent company with the likes of Ronald Reagan (Robert Lindsey) and David Beckham (Tom Watt). Disgusted with PA corruption, they voted for Hamas. 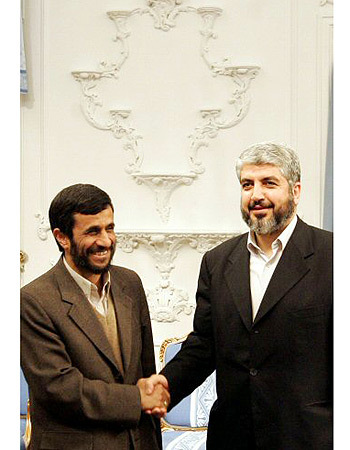 But the man calling the shots is not Haniyah, the Hamas leader living in Gaza. The man calling the shots is Mashal, the Hamas leader living in Damascus and, hence dependent on Ahmadinejad’s side kick Bashir Asad. It was he who for the sake of his Iranian/Syrian pay masters said no to the renewal of the cease fire with Israel. Following are ten top questions needed to engage in strategic discussion of the ongoing Israel-Hamas confrontation in Gaza. These items can be altered if ground developments would take different directions in the next days or weeks. We buried our father yesterday. His name was J.J. Hurley. He was 89 years old. But, if you love your parent that does not begin to tell the story. Obituaries are like deck chairs on the Titanic. Adornment is never a satisfying explanation for the way your heart feels for someone who was larger than life. For the woman in his life, his five children and seven grandchildren he was always there. A presence of wit, strength, honor, charisma and selflessness. It is difficult to lose a parent. It is devastating to lose one you loved and respected on a daily basis. WMD Strikes “Highly or Less” Likely over the next five years? An intelligence assessment, the “Internal Homeland Security Threat Assessment for the years 2008-2013, obtained by the Associated Press projected several “dramatic” developments. Permanent link: WMD Strikes “Highly or Less” Likely over the next five years? Permanent link: DEMOCRATIZE JEWISH CHARITIES? Simon Deng, Darfur activist and escaped slave from South Sudan, just returned from a trip to Israel, where he was advocating for the South Sudanese Christians there. He tells me something this Christmas day that is very sad: the mayor of the Southern Israeli town of Eilat has banned South Sudanese Christian refugees from working in the hotels there. On the eve of this Christmas 2008, I will shift from my ongoing field of research and commentary in Terrorism, international and ethnic conflict and global strategies to address a subject dear to the heart of many among us, and dream maker to most of us, i.e., the children: Christmas. On the day before Christmas Eve, Team Obama dumped its own “internal review” of its contacts with Democratic Governor Rod Blagojevich, arrested several weeks ago on federal corruption charges for allegedly attempting to sell Obama’s Senate seat. Permanent link: Happy Bleeping Holidays!